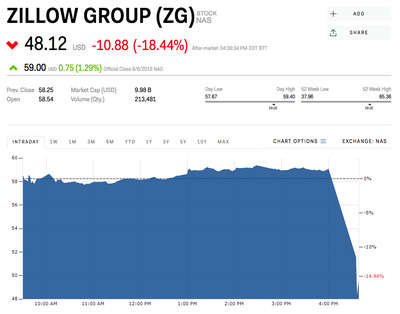 Zillow shares fell by as much as 19% in after-hours trading after the company’s third-quarter revenue guidance missed analysts’ expectations. The online real estate database said it sees Q3 revenue coming in between $US337 million and $US347 million. Analysts had estimated $US408.4 million according to Bloomberg. Second-quarter revenue also missed forecasts, at $US325.2 million ($US325.5 million expected). Zillow also announced that it acquired Mortgage Lenders of America to bolster its home-flipping business. The company halted its stock after the market close on Monday, pending the news. Shares had jumped 45% this year through the market close.